Referred to as the “flower of nutmeg,” mace is the lacy covering of the nutmeg seed, and has a more aromatic and bitter flavor than nutmeg. Its spicy and bitter clove-like flavor provides an intense aroma to Middle Eastern and Asian foods. 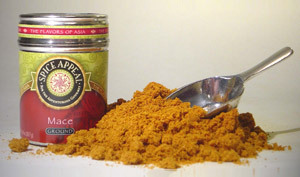 Add to Southeast Asian and Indian garam masalas, curries, sauces and cakes. Use in cream soups, cream sauces, chowders, crackers, pie fillings and cakes. Mace is the commercial flavor in hot dogs, doughnuts, pickles and icings.